Fresh-caught Bay oysters, fluffy linguiça omelets, and sugar-dusted malasadas—New Englanders travel for hours to feast on these binge-worthy dishes created in Cape Cod, home to America’s first international foodies. Enjoy a unique culinary adventure on your next resort stay at The Soundings Seaside Resort in Dennis Port, MA! A treasure trove of eateries line your path as you work your way from the Upper to the Lower Cape. In whimsical towns and Colonial-era villages, chefs busily cultivate culinary pearls and prepare the ocean’s bounty in everything from roadside seafood shanties to hip lobster houses, and everything in between. From mollusks and crustaceans to sweet treats, it’s a world of scrumptious fare. This is flavor worth the drive. So how did our first foodies find their culinary groove? It began when Native Americans shared corn, oysters and lobster with the Pilgrims, revolutionizing British stews and pies. Portuguese sailors then kicked things up a notch with sausages called linguiça and choriço. Next, Caribbean spices and rum gave desserts an exotic flair. By the time they’d finished settling the Bay, Cape Cod dishes had become works of culinary genius. Raise your hand if the morning meal is your favorite of the day! 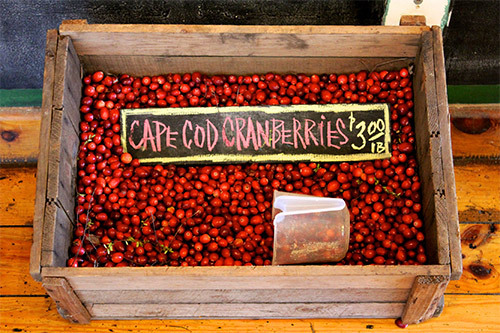 Cape Cod breakfasts can include linguiça omelets, crab cakes, and even lobster benedict. Order pancake stacks with local cranberries, blueberries or maple syrup and you won’t be disappointed. Or try a more exotic johnnycake, a cornmeal flatbread known as the New England version of the tortilla. The secret to growing Wellfleet and Cotuit oysters is location, location, location! Salinity and water temperature are the most important ingredients in producing shellfish with a sought-after sweet flavor. And if you’re visiting the Cape, you’re in luck. The finest oysters in the country are grown right here in local bays. But to find the best of these shelled treats, you’ve got to catch the season. Cape Cod Oyster harvests begin in October and run through February or March. We recommend you call a few restaurants for news on the day’s catch. The unassuming lobster roll deserves its own mention as the king of New England sandwiches. Though the recipe calls for simple ingredients, the title of “best” is hotly contested. A good lobster roll demands steamed lobster meat pulled right from the shell, and the perfect ratio of mayo, salt, and pepper. What’s the secret to this sandwich? It’s in the toasted hot dog roll, a type of roll with flat sides that’s sold mainly in New England. Ah, the elusive quahog. It may look like a Frankenstein-sized clam, but it’s a shellfish in its own class. The ‘stuffie’ is a snack prized by New Englanders along the coast, but take note–the competition for best stuffie causes friendly family rivalries. Recipes vary but always include a mix of bread crumbs, chopped quahog meat, plenty of seasoning, and linguiça–a spicy Portuguese sausage that gives it a real kick. Scoop the stuffing back into the quahog shell, bake, and voila! Top your stuffie with Tabasco® sauce, and you’ve prepared the quintessential fisherman’s treat. 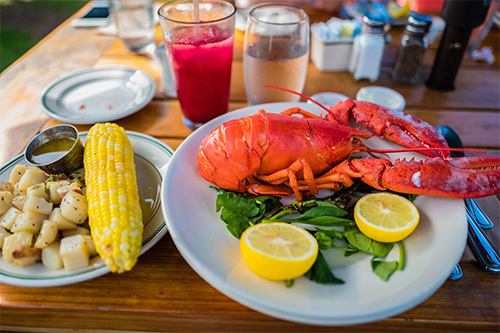 No trip to New England should ever end without an amazing lobster feast. The good news is that on Cape Cod there’s no shortage of choices in venue, from clapboard shanties to chandeliered dining rooms. Whether you prefer your lobster stuffed, steamed, or baked, you can have them all! 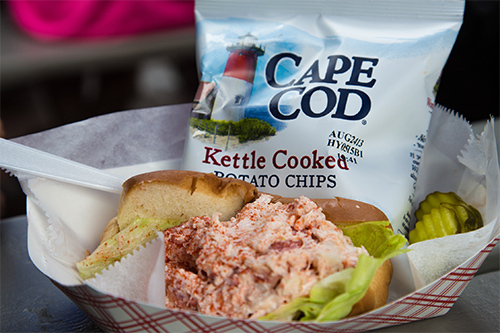 So bring out your finest bib, grab a nutcracker, and head off to any of these eateries, just a few of the best Cape Cod can offer. Native Americans taught pilgrims the joys of briny delicacies like coldwater oysters and clams. First on your seafood list is the great New England Clambake, a Down East dish that brings together the richness of deep-sea lobster, sweet native corn, regional clams known as steamers, and potatoes. The ingredients are flavored with a layer of seaweed and cooked over hot rocks. A steamed version of this dish called a Crab Boil is served at restaurants all over the Cape. But if you find an authentic Bake, you’ll enjoy its signature smoky, briny flavor. Ice cream licking is a serious sport in New England. Home to generations of dairy farmers, New Englanders know how to churn leftover milk into gastronomical gold! You’ll also find flavor combinations here that you won’t find anywhere else. For example, grapenut pudding–neither a grape, nut, nor pudding–is a favorite local flavor. 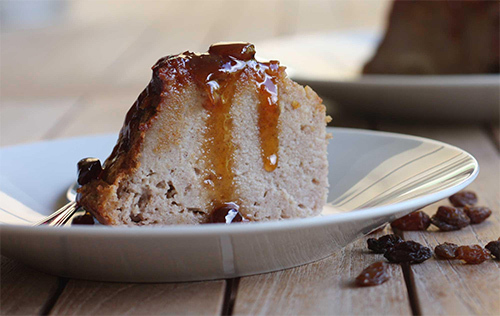 But maple walnut and rum raisin also give grapenut pudding a run for its money. And, just in case you hadn’t had your fill, you’ll find cranberry flavors too. More baked good than pudding, this dessert is popular worldwide and is an old-school favorite in New England. Cinnamon, nutmeg, and vanilla from the Caribbean have taken an otherwise bland dessert and made it exotic. Add butter and a tasty Jamaican rum sauce and you’ll soon be hooked! The British may have brought savory pies, but native cranberries and apples changed the pie and dessert world forever. Caribbean spices soon found their way into sugared recipes and a new-fangled bakery industry was born. Bakers and candy makers who want to join in on the fun have worked local cranberries into scones, cookies, and muffins. You’ll also find them in fudge, gummy bears, pecan clusters and more! Malasadas, a golden cloud of fried dough dusted with powdered sugar, are a heavenly must-try. The warm and delicious wonders made with eggs, butter and milk hails from Madeira and the Azores. Sure, you can find Malasadas in Hawaii and Massachusetts, but nowhere else on earth are they the piping hot, crispy-yet-chewy confection found at Provincetown Bakery. Add a dash of cinnamon for a spiced treat. 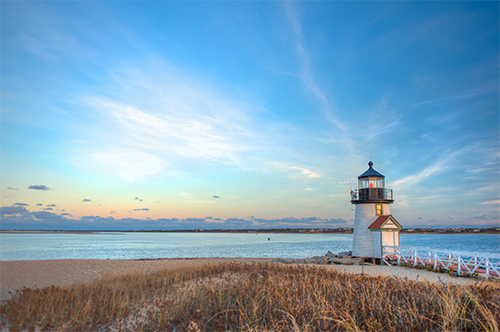 Sign in to your account to book your next Cape Cod vacation today!